My favorite aspect about being a writer is coming up with a cool story idea and letting it unfold. I generally don’t know how the story is going to play out (although I usually have an idea of how it will actually end). I like to create characters, put them in situations in the context of story, and make them work through different scenarios. It’s a process of discovery for me. I don’t have one specific genre that I write. I come up with what I think are cool ideas for short stories or novels and write. Having said that, they tend to fall into the genres of horror, fantasy, and science fiction. My favorite genre is horror, both as a reader and an author. My most recent novel, Conjesero, is actually the first novel I’ve ever written. I started writing it about fifteen years ago, and my original version was not especially good, looking back at it from the perspective of an author whose writing skills have evolved and improved considerably since then. It took many revisions before I finally got to the point that I was happy with it. I almost never outline. And if I do it will be something like two or three sentences with a very high level overview of the story. I couldn’t imagine outlining. I let the story live inside of my head, and I plot it out a few chapters ahead and how it’s going to evolve. I think about how the characters are going to react when I put them in different scenes. By the time I actually write, it flows pretty well because I’ve put so much thought into it. I started writing when I was in high school—not writing well but writing nonetheless. I majored in biomedical engineering in college and gave up on writing all together since I didn’t have time for it. Years later, my wife said to me, “Hey, you used to write. Why don’t you start again?” That was all the prompting it took to have me resurrect my writing career. My first novel published is Two For Eternity published by the now defunct Weaving Dreams Publishing. It was the fourth novel I wrote, and it took almost ten years from when I resurrected my writing career to that being published. I am fluent in Portuguese. Also, my day job is an engineer. I’ve spent my entire professional life working in various capacities as an engineer for pharmaceutical and medical device companies. I bounce from short stories to novel writing all of the time. I also work on about three different novels at any given time. For me, it keeps the writing fresh. I would love to go back to Hawaii where I went for my honeymoon. That place is paradise. I would also love to go to Fiji, which I’ve never been to. I’m an avid horror reader. My favorite all time author like many horror aficionados is Stephen King. Of more recent writers, I love to read Brett J. Talley. Carl is the author of four published novels which span the horror, fantasy, and science fiction genres in no particular order. He lives in Central Pennsylvania with his wife and the two most awesome boys you have ever met. When not feverishly conjuring stories about monsters, aliens, and things that go bump in the night, he works as an engineer for a medical device company. Find out more about him by visiting his website at www.carlalves.com. San Francisco homicide detective Kevin Russell has arrested serial rapists, murderers, and more sadistic thugs than he could remember. 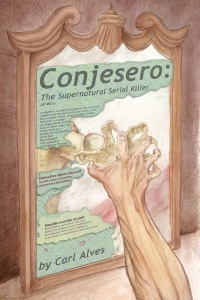 Nothing he has ever accomplished can prepare him for Conjesero, a supernatural serial killer who has been terrorizing the Americas for centuries. Conjesero—a creature with extraordinary intelligence and a vicious nature that has created a trail of bodies from Mexico to San Francisco—has always made law enforcement cower in fear and pretend that he doesn’t exist. Only Kevin is willing to stand in its path. His desperation takes him on a journey inside the killer’s twisted world. There is nothing that he is unwilling to do, even if it means making a deal with the devil to stop Conjesero or die trying. Paul was not sure how far he had strayed from his Lexus. He looked at his watch. He phoned Kevin ten minutes ago. He had enough of these woods. He wanted to get back in his car, turn on the radio, and not think about what may or may not be lurking nearby. If he spotted Kevin’s SUV, he would get out and flag him. From his position, he could not see the road, let alone his vehicle. If the woods were behind him, then the road had to be in front of him, or so his logical mind figured. More branches broke, this time closer. He quickened his pace. For about the tenth time he wished he had a flashlight instead of the light from his cell to illuminate the area. This time the heavy thud of feet on grass pierced the quiet night. Instead of turning to investigate, he continued walking through the impenetrable fog. He was not sure if his eyes were deceiving him or if he actually saw the shiny metallic silver of his Lexus. He strained to look. Not only did he hear movement, he felt something behind him. Something large, breathing heavily. He walked faster. The distinctive silver shine of his car gleamed through the fog like a beacon of hope. The footsteps became louder, and Paul could no longer temper his fear. He ran, the footsteps behind him quickening. Paul shoved his hand into his pocket, found his bulky key chain with its remote key fob, but had to slow to a trot to figure out which button to press to unlock his car door. He pressed the remote button twice, and the headlights flashed, indicating the car was unlocked. He cut sharply to the right, making a break for the driver’s side, but tripped and flew face first into the dirt and grass, filling his mouth with soil. He spat and swiped away the grass that clung to his forehead. He propped himself onto his elbows and tried to clear his head. Everything in front of him was a haze. He frantically searched for his keys, but lost precious seconds before finding them next to his left knee. With keys in hand, Paul shot to his feet and found himself face to face with a creature more terrifying than anything his worst nightmare could conjure. He gasped before pain racked his body and everything went black. This entry was posted in Guest Blog and tagged carl alves, Conjesero, fantasy, horror, science fiction by Steph. Bookmark the permalink.